How wide is the baseboard and crown moulding? 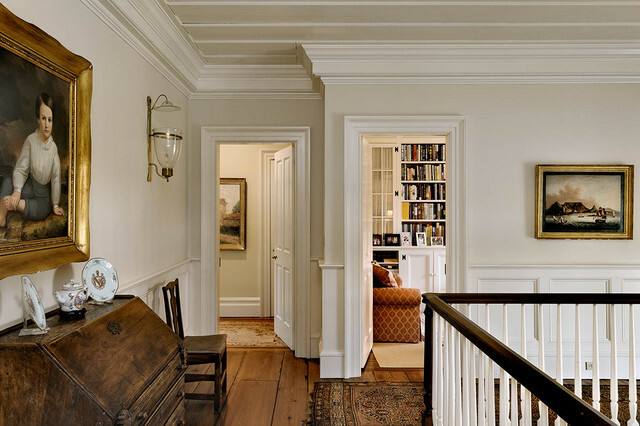 - Love the trim/ mouldings. Is the crown moulding one piece or more? Please I would like to know the size of the door trim as we'll. I would love to know more about the crown moulding. Thanks so much in advance! Amazing build-ups! - I see that this appears to be a common area hallway - did you use a similar crown build-up in the individual bedrooms? Beautiful space. Use one of our Art Lights to give life to your masterpieces. What was your source for the flooring? Trim color - Gorgeous room. What colors are the trim and ceiling? What is this gorgeous floor? Exquisite Woodworking and wonderful floor in a classy traditional style. Crisp Architects always have the best photos :-)... and floors too! Please confirm the color of ceiling and trim - You have said the wall color is BM Navajo white. Please tell me the trim and ceiling color. We believe it is White Dove. Try a few sample colors in your space to get the exact look you desire. We do sample colors on every project. It amazing how the right color is often the wrong one on the swath or in the store. I absolutely love this space. Is there a stain on the floors? - Is there a stain on the floors? Thank you. I guess I am so use to have a darker stain on my floors which are oak and I also have some black walnut floors and not use to reclaimed pine floors. These are beautiful. The place I bought them from just can't believe I want to put a stain on them and honestly they recommend just putting an oil and nothing else. Really enjoy your work, can u tell me wall and wainscoting colors. Navajo White Benjamin Moore for the trim, and Farrow & Ball James White for the walls. Hi, What colours were used for the staircase? Thank you? What are the paint colors for woodwork and walls? Thanks. - They are beautiful. Unfortunately we do not have a record of the colors chosen for the walls and trim as it was chosen by the client. However "Navajo White" by Benjamin Moore might be a close match for the wall color. Reclaimed wood floors - How do I get this? You can also try your local lumber yards and mills and they should be able to offer similar styles. Rug - Absolutely love the rug in the foreground. Can you provide your resource? Thanks! Thanks for your interest! Unfortunately I have no info on it, it was found by the client without us. There are 2 different answers for the paint colors for the landing? - The colors for the wall and trim on the landing are contradictory. In one instance the pro notes Benjamin Moore and another comment Farrow & Ball with Navajo White Ben Moore trim. Is there anyway to know what was truly used? Thank you. Thanks, as an architecture firm we do not normally keep a record of the paint colors used, sorry for the confusion. I believe Benjamin Moore Navajo White is the color of the walls, but I suggest you get paint samples and see what works with the lighting in your home. The work our photographer does with lighting may distort some of the paint colors to what they look like in real life. I hope this information helps. 4. Pay Attention to HistoryWhite is classic, formal, refined and restrained in style. For your Greek revival or federal interiors, white will be expected on trim and on walls in the kitchen and third-floor bedrooms. Make the mistake of painting everything white, and your home will look like a builder’s “flip.” Color selections can, therefore, have contextual requirements that need to be respected if you want your choices to support the history of your architecture. Nothing says “wrong” more than white painted trim paired with walls painted a saturated color in a midcentury modern home.